Musician based in Portland, Oregon, works in improvisational live performance. All of his projects concern the use and development of improvised music in diverse forms and contexts. For the last 15 years he has presented his work all over the United States with a wide variety of musicians, dancers and visual artists from around the world. He is known in underground, academic and free improvised music circles for a highly idiosyncratic approach to guitar and electronics. Doug investigates the reciprocal contamination of creative means and sensibilities. He uses varied organic and electronic sound instrumentation, concrete sounds, voice, light gradients (sensors), space and performative movement in connection with architecture and notation systems. Technology has always been an integral part of Doug’s guitar setups and forms the crux of his current activities. In the past two years, Doug has concentrated his efforts on building an instrument for controlling sound through light via MIDI programming and real-time light changes. From a wave of the hand in midair to the guitar’s own internal feedback, signals produced from the guitar are manipulated and replayed in unpredictable, unrepeatable permutations through the use of gestural controllers and the software program LiSa. 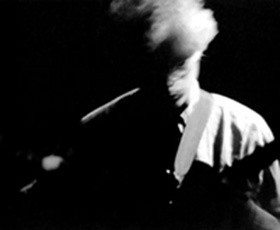 Since 1998, Theriault has focused on two distinct performing genres: Freely improvised performances on a conventional guitar, and experimental free improvised music and dance collaborations performed on the sensor guitar and other devices.